Contemporary relational database vendors must provide query results in a form that can be consumed by popular XML technologies, such as parsers and XSL-T processors. The most popular mechanism for generating XML data from relational queries is known as or SQLX, an ISO /ANSI standard. Virtuoso's SQLX features apply to native relational tables, and to tables linked via the VDB. 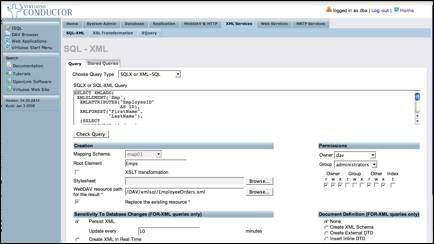 SQLX comes to the rescue when the need arises to create XML document instances from relational data. Virtuoso's power is exemplified by its ability to invoke SQLX against attached databases that do not support native XML data types. SQLX is a SQL superset introduced via function calls, rather than changes to the SQL language syntax. At first glance, SQLX may appear a bit awkward when juxtaposed with traditional SQL. Compared to other programmatic methods for generating XML, this syntax of function calls is clean, logical, and fits the workaday model of forming relational queries. SQLX has many available functions, four of which are commonly utilized: XMLElement, XMLForest, XMLAttributes, and XMLAgg. XMLElement is the most common function called in SQLX queries. The XMLElement function creates an XML element, including attributes and/or child elements. XMLElement is an open-ended function, allowing the arbitrary addition of elements as child nodes, by simply appending as arguments. This verbose query construct is a result of XMLElement function calls used to build the children of the 'Emp' element. The XMLForest function is a more compact method to accomplish the same task. XMLForest is a shortcut for generating a set of elements with only columnar content. It takes as its arguments a set of column names or aliased column names. The results of this query is identical to the XMLElement example, but the syntax is more compact. Identifying information is often exposed as an attribute within a containing element. In order to promote the 'ID' element to the status of an attribute in the 'Emp' element, use the XMLAttributes function. The XMLAttributes function operates in a similar fashion to the XMLForest method in that it generates a set of attributes using columnar content. It takes as its arguments a set of column names or aliased column names. The function must be included as the first child arguments to the XMLElement function. The result of this query yields the desired effect of promoting the EmployeeID value to the status of an attribute rather than an element. The XMLAgg (aggregate) function is used to perform a query returning multiple rows. XMLAgg aggregates a set of rows in the result set, emitting the XML specified as the XMLAgg function's argument for each row that is processed. The previous basic examples cover the popular query types using SQLX. The generation of XML documents with complex hierarchies requires nesting joined SELECT statements within child XMLElement and XMLAgg definitions. Unlike standard SQL, SQLX is capable of generating a rich hierarchical output. The query that produced the example output document is comparable to a standard nested SQL SELECT statement. As SQLX is an extension of SQL, SQLX queries may be issued using the standard SQL interfaces and APIs. Once logged into Virtuoso's Administrator interface, click the link labeled 'Query Tools' in the tree to the left of the screen. A new set of items will appear directly below the 'Query Tools' item, click Relational Data using SQL'. You will be presented with a SQL querying interface. Notice that this result is different than the results demonstrated in previous sections. Canonically, the two results are identical. XML ignores white space unless explicitly directed not to. Continue cutting, pasting, and executing the other examples. Other than formatting, the results are consistent with the examples. Try making modifications to the queries, such as renaming the elements that are produced, or promoting all of the elements to attributes. Virtuoso will check for syntax violations and report these errors. Virtuoso allows saving SQLX queries in the WebDAV repository and virtual directories. In order to access an XML query result, point a browser or XML processing tool to the previously defined URI. Virtuoso may generate this document upon request, or can periodically re-generate the document. Set the following fields to their respective values, and click the 'Execute' button. Navigate to the 'HTTP Hosts & Directories' sub-tab under the WebDAV & HTTP. 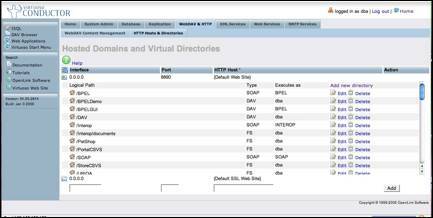 In the 'HTTP Hosts & Directories' screen, expand the directories left of the default port and Default Web Site. by clicking on the folder icon. Once the directories are expanded click on the 'Add New Directory' Link at the top of the directory. Set the following fields to their respective values, and click the 'Save Changes' button. Executing queries interactively from the administrative interface is useful for diagnostic purposes, however, most database interaction with Virtuoso is accomplished through the use of application logic. The following examples demonstrate two simple programs using the Java JDBC API. The JDBC API is a driver-managed system that connects to databases using a simple URI-based connection. Ensure that this jar is in the Java CLASSPATH environment variable. It is beyond the scope of this document to explain how to manage the CLASSPATH. In Windows, set the system's global CLASSPATH using the 'Environment Variables' dialog which is available under 'Advanced' tab in System Properties. Simply add the full path to the Virtuoso jar to the end of any existing CLASSPATH variable, using a semi-colon (;) as a separator, or create a new environment variable if the CLASSPATH variable does not already exist. This is a very simple example that opens a connection to the Virtuoso demo database, issues an aggregating SQLX query, and displays the textual results to standard output. The modest results of this program belie the power of the underlying foundation for building complex and functional JDBC applications. A simple extension to this program would to add the ability to store results into a text file, rather than displaying them on the screen. As SQL is the dominant language of database applications, so shall SQLX become the extension of choice for the extraction of XML from relational resources. As a relatively simple, intuitive, and easy to learn SQL language add-on, SQLX is a great tool for the for aggregating data across the enterprise. More information on various technologies mentioned in this article is listed in the following table.